DAVAO CITY -- Presidential frontrunner Rodrigo Duterte said Monday he would hasten the country's infrastructure overhaul and place more checks against corruption if elected president. The 71-year-old tough-talking mayor is poised to win the election based on the last surveys before the balloting and the latest partial, unofficial results. Incumbent Benigno Aquino initiated the ambitious Public Private Partnership (PPP) program to secure private sector funding for new toll roads, airports and train systems. However after six years, only the four-kilometer Daanghari project was among the major ones that were completed. "I will make it faster," Duterte told reporters, when asked about the PPP. "Everything that is good for the Filipino will be continued." Duterte said he was looking to appoint his long-time friend Jesus Dureza to his Cabinet. Dureza had served as ex-president Gloria Arroyo's presidential peace adviser and press secretary. "Dureza is a key player in the peace process both internal and external," he said. 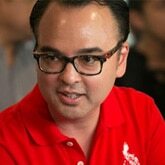 During his final campaign rally last Friday, Duterte said he plans to appoint his running mate, Alan Peter Cayetano to the Cabinet if the senator loses in the vice-presidential race, after the one-year ban on losing candidates.